I have been waiting for an occasion to make a big layer cake. I'm not that great of a baker and after a few failed attempts, I still feel the desire to get it right one of these times with the perfect cake and frosting recipes. I want it to be understated and beautiful and decadent. Like Tara's cakes. 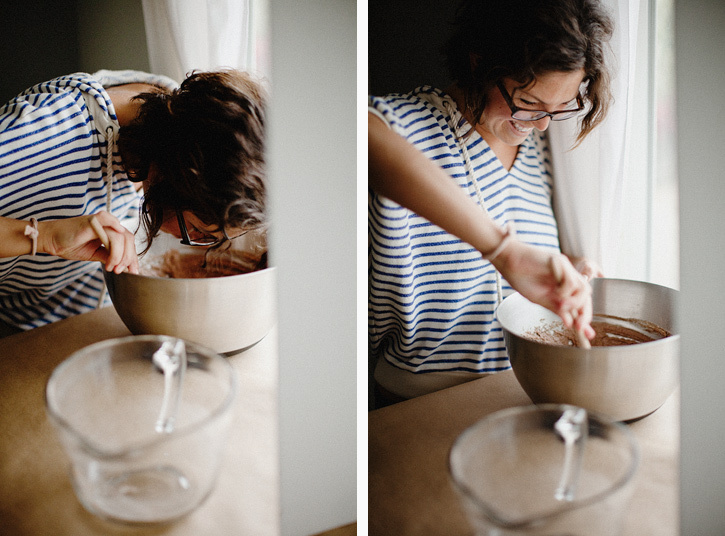 I am attempting her recipe next in hopes of a cake like that. 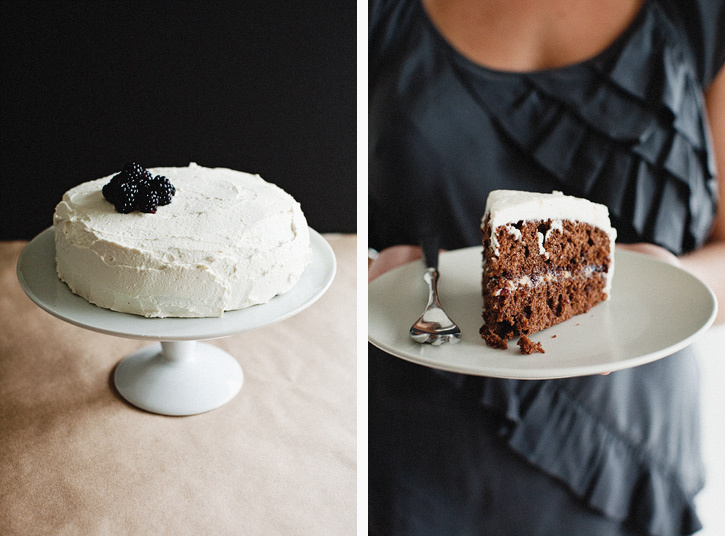 So, what does one do mid-week when you want cake but maybe not a triple layer situation? Cupcakes, of course. Cupcakes on an ordinary Wednesday made me think of small victories - of little things that are going right, like finishing taxes and friends with a new healthy baby and picking a paint color for the nursery... reasons to celebrate with cake that may not be a birthday. You can always find people to help you eat cake. I pulled this cupcake recipe from the new Oh She Glows Cookbook by Angela Liddon that is packed with a great collection of vegan recipes. It is a lovely resource for those on a vegan diet or otherwise just trying to eat less meat and dairy and more produce. Because it was what I had, I substituted dutch processed cocoa for the natural stuff here. I know, I know. I altered the baking soda/powder and things got funky and I don't recommend doing that. Do as I say, not as I do. 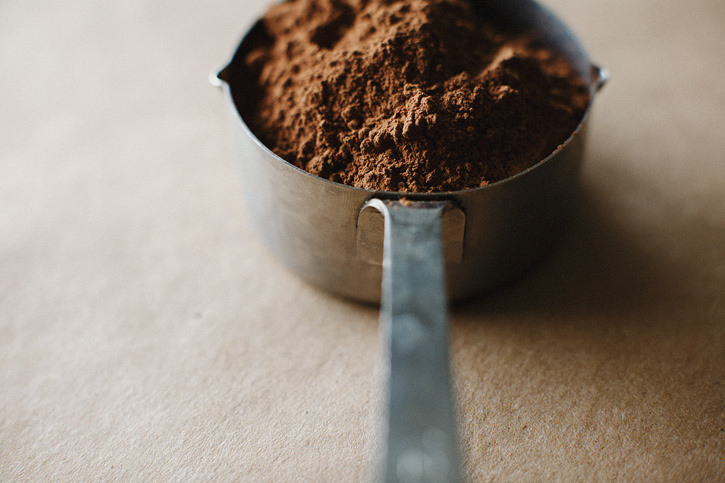 I am writing the recipe as published, with natural cocoa. If you want to use dutch, find another recipe, the acid v. alkaline ratio doesn't work with it here. The frosting is not so vegan, but I always prefer mascarpone based frostings over buttercream (vegan or otherwise) and I was the one who would be consuming most of these so there you have it :) To weekday cake! In a mixing bowl, combine the non-dairy milk and vinegar. Let them sit for a few minutes (this creates a vegan buttermilk). Add the vanilla, sugar and coconut oil and stir to mix. 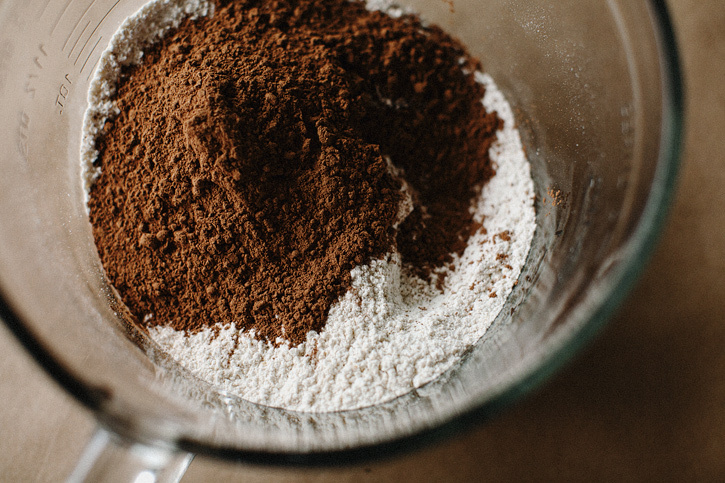 In another bowl, sift together both flours, cocoa powder, baking soda and salt. Add the wet mixture to the dry mixture and stir to combine. If the coconut oil gets chunky because it got cold, use a mixer or whisk to break it up (Angela suggests an electric mixer but I was afraid it would make the cake tough). Grease a muffin tin or line it with liners. Fill the vessels 3/4 full for 10 cakes, 1/2 full for 12. Bake on the middle rack for 21-24 minutes or until a toothpick inserted into the center comes out clean. Let the cupcakes cool completely. While the cupcakes cool, make the frosting. With a hand or stand mixer, combine the butter, mascarpone, powdered sugar, cocoa powder, vanilla and milk and mix until smooth - adding a tiny splash of milk as needed to thin the frosting. When the cakes are cool, frost them and top with a bundle of fresh strawberries. My personality falls somewhere around type A-. I like order, organization, a moderate routine and things done right, but only to a certain extent. My bed is made before I leave my room in the morning, I could tell you every item in my fridge and in what order I need to use said items to not waste any food, I give copies of my travel documents to my parents before I leave the country, I have never run out of gas, missed an appointment or been late on a payment. On the contrary, I have a terrible habit of not always putting on my seatbelt and exceeding the speed limit. I've been known to go days without drinking water. I choose which rules do and do not apply to me, hate reading or listening to directions and am a terrible measurer (which makes writing a cookbook sort of interesting). I have been wanting to make a layer cake for quite some time, it even made my list of 'things to do before I turn 30', so I set out to cross that off my list while I still have a few years to perfect the goal. My discretion in baking, as it is more about perfection, is typically off (see paragraph 1). It is not a science I am invested in. I did however want this cake to be my own, so I flipped through numerous books comparing ratios of liquid to dry to cocoa, to make sure that with my expectations and friends coming over to celebrate my birthday, it would at least hold itself together. I tried to lighten it up as much as I could, but I didn't want to take too many risks - a layer cake is kind of an investment, not the time to get hard pressed on caloric content. So I gladly spent my birthday afternoon, in the kitchen, measuring and taking careful note of my baking project. I settled right in to that A- spot, allowing myself freedom with ingredients while conceding to the ratio I'd studied. Myself and the blog share the same birthday, so as fun as it's been celebrating with my sweet husband, family and friends, I am also so grateful that you are here. This space is responsible for creativity, encouragement and new friendships for me, and the community continues to amaze me. You are wonderful people. Thank you. I wish I could share cake with you. You can make the pastry cream a day or two in advance to get ahead. I frosted my cake about three hours before I served it and it held just fine in the fridge. If I were to guess, I'd say it would be fine in there for about 6-8 and keeping the integrity of the whipped cream. I am a big fan of muscavado as a natural cane sugar, but light brown sugar is a fine alternative. Lastly, this cake is on the dense side. The batter is pretty thick and it doesn't cook for long. The filling and whipped cream balance this out, but if you like a more moist cake, swap in oil for the butter. I haven't tested this, but it's worth a shot. 1. To make the pastry cream, heat the milk, cream and vanilla bean in a saucepan until just boiling at the edges. Turn off the heat and let it steep for 10 minutes. Open up the vanilla bean and scrap the seeds into the milk. Whisk the yolks and sugar together in another bowl. While whisking, add a bit of warm cream to the yolk mixture to warm it up, add another half cup, continuing to whisk. Now that everything is the same temperature, add the warm yolk mix to the saucepan. When the mixture starts to simmer, add the flour 1 Tbsp. at a time, while whisking, like you're making a bechamel. It'll take about 30 seconds and you'll see it start to thicken, once it looks like the consistency of sour cream, turn off the heat, and continue to stir a few more times to make sure everything is smooth. Stir in the butter and salt. 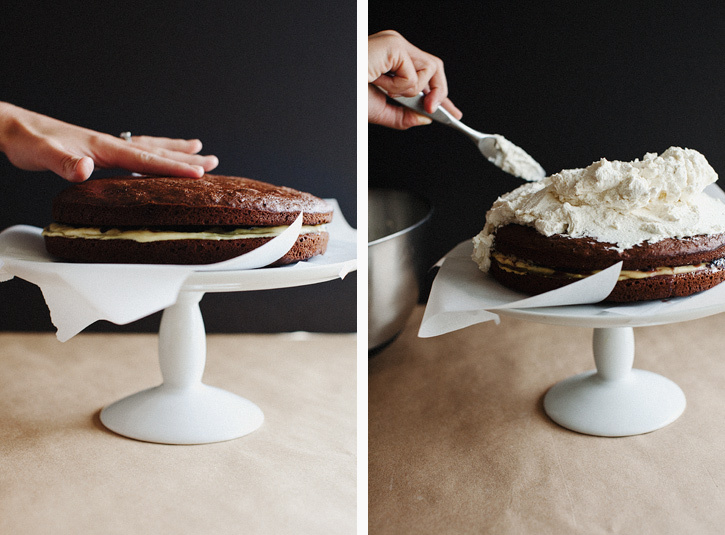 Let it cool and transfer to the fridge while you prepare the cake. 2. Preheat the oven to 350'. Butter two, 9'' cake pans. Line the bottom with parchment for cake removal insurance, and rub a bit of butter on that as well, set aside. For the cake, cream the butter and sugar together until light and fluffy, about two minutes. Add the eggs, agave and buttermilk and mix until evenly combined. In another large mixing bowl, sift all of the dry ingredients together, getting rid of any clumps. Add half the wet mixture to the dry, stirring gently, add the remaining wet mixture and stir to just combine. 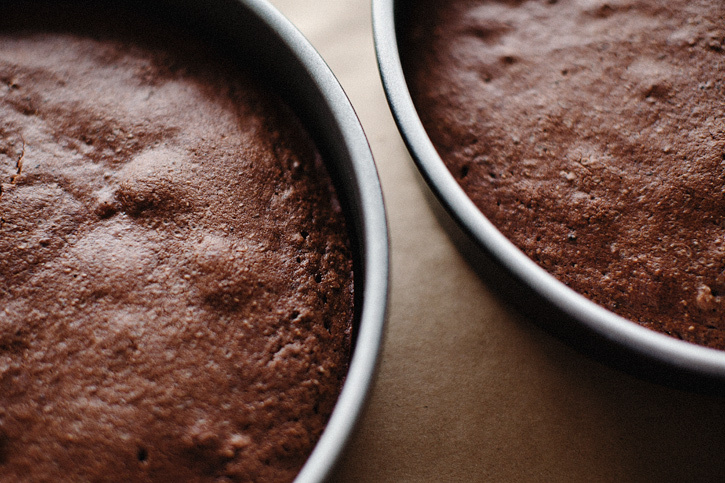 Stir in the chocolate and divide the mix between the two cake pans. Bake on the middle rack for 14-16 minutes. Check for doneness by sticking a butter knife in the center, being sure it comes out clean. Remove and cool completely. 3. Once the cake is completely cooled, invert it out of the pan and remove the parchment. Place one layer, with it's most even side up, on the plate or stand you'll serve it on. I like to slide a few pieces of parchment around the outside to keep it clean. Spread the pasty cream all across the top surface (you'll think it's a lot, but add it all, the cake absorbs it while it sits, it's not as thick as you think). Gently spread the preserves on top of the cream, it will mix in a bit and that is fine. Place the other cake on top, pushing in any filling that smushed out. 4. 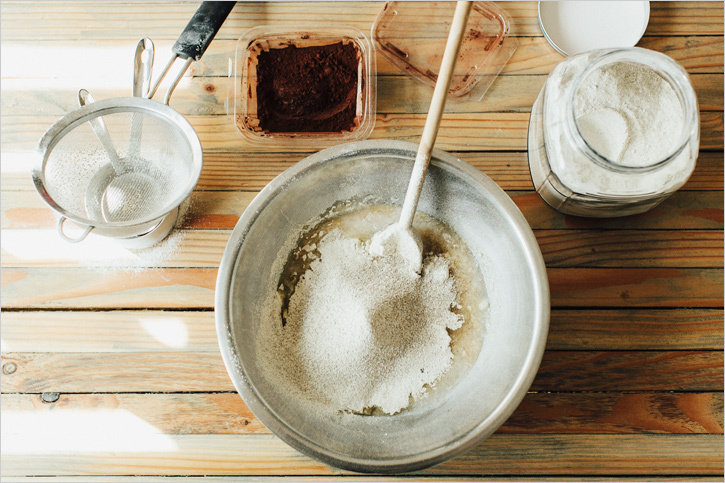 Whip the cold whipping cream with an electric or stand mixer, once it starts to hold shape, add the confectioners sugar, muscavado, vanilla and a pinch of salt. When you get stiff peaks, about 3 minutes, add the mascarpone and continue to whip until evenly combined. 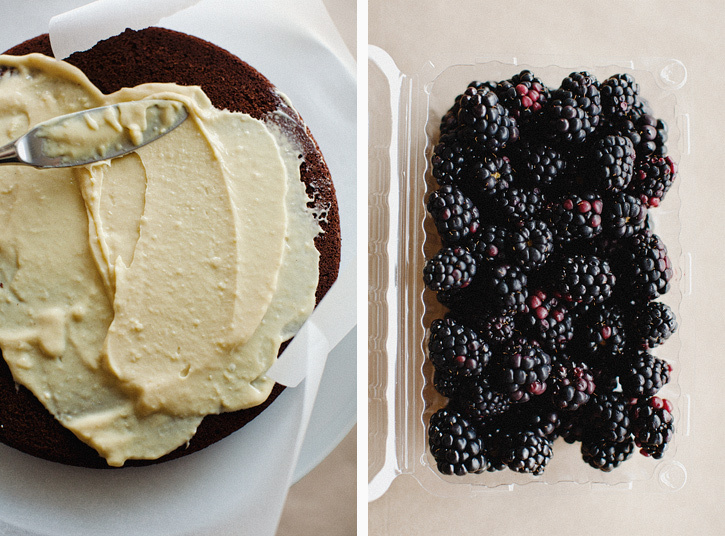 Frost the cake generously and garnish with fresh blackberries. 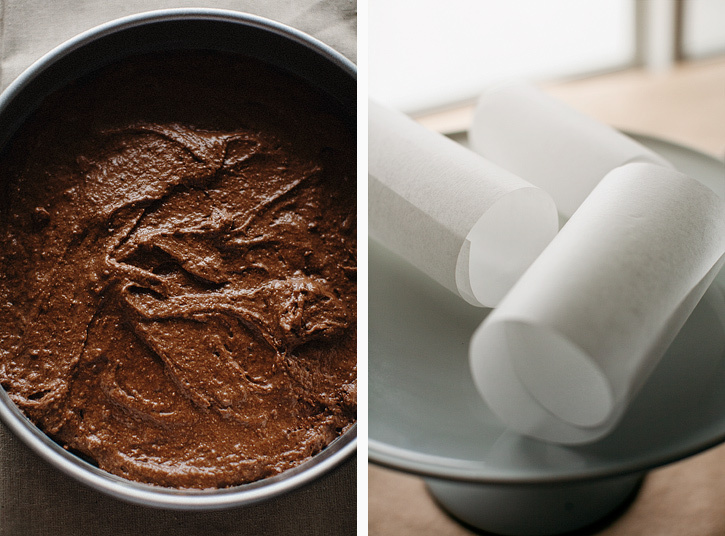 Cake can be kept in the fridge for about 6 hours. If it chills in teh fridge, let it sit at room temperature for about 30 minutes before you cut in to it. Cold cake isn't as flavorful. * I piled all the frosting on top and gently pushed it down the sides to frost.